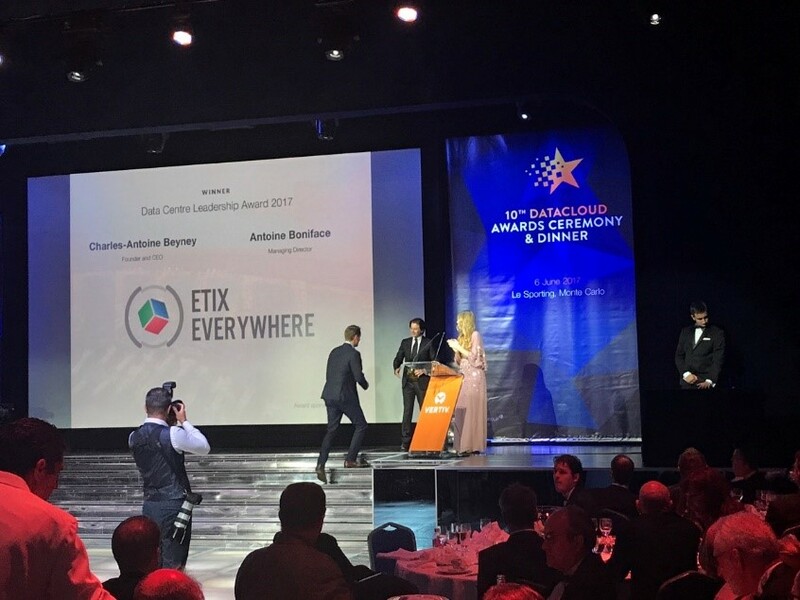 DataCloud created the Data Center Leadership Award to honor individuals in the industry who display an extraordinary commitment to excellence and innovation.This year, the award was presented to Etix Everywhere co-founders Charles-Antoine Beyney and Antoine Boniface who were chosen from among a group of 24 other contenders. The pair were recognized at the 10th annual DataCloud ceremony and dinner at the Grimaldi Forum in Monaco. Etix Everywhere takes a holistic approach to the data center market, offering services for the financing, design, construction and operation of intelligent infrastructures. Mr. Simon also mentioned Etix Everywhere’s growing international presence. “Charles-Antoine Beyney and Antoine Boniface are innovative thought leaders and educators. They have created solutions in Africa as well in South America, which are revolutionary in terms of speeding up data center roll out, connections and access, thus helping to overcome the digital divide,” added Mr. Simon. Etix Everywhere has been growing steadily since 2013, when the company opened its first data center. Since that time, Etix Everywhere has opened six data centers, with eight more facilities currently under construction in both Tier 2 and 3 markets spanning across the Middle East, Europe, Africa and South America. The company also has projects in twenty more countries that are currently in advanced negotiations, growth that has expanded its staff to 100 employees. Etix Everywhere has developed its own data center technical design, built with a scalable architecture that can be deployed globally in less than 16 weeks. As Mr. Simon, the DataCloud judge, alluded to in his statement, the company offers a co-investment model, which allows local joint-venture partners to share investment, resources and profits. The company is also highly committed to innovation and the use of disruptive technologies, as 30 percent of its staff is devoted to its R&D pool, Etix Labs. Antoine Boniface commented on Etix Everywhere’s hard-working staff. So, what’s next for Etix Everywhere? In partnership with NRB, the company is currently working on its next launch, a new colocation data center in Liège, Wallonia, Belgium, the first phase of which will occur during the last quarter of 2017. The data center, which will enhance Belgium’s data housing and cloud offerings, will provide 900 square meters of IT space with 900 kVA of power at full build-out. To learn more about Etix Everywhere, click here.